Hello! Well, today is my eight month mark on the mission. Crazy, huh? Last Monday was a fairly relaxed and easy preparation day. Just lots of emailing and some routine stuff. Tuesday, all the sisters had interviews with our sister training leader. That was really good and definitely helped me self evaluate where I am as a missionary. Even though I’m getting to being a decently “experienced” sister I guess you’d say, I love that there is something that we can always be working on and improving. I guess that’s one thing that I’ve definitively learned on my mission- always be pressing forward! Love these crazy sisters! (Me, Sis. Draney, Sis. 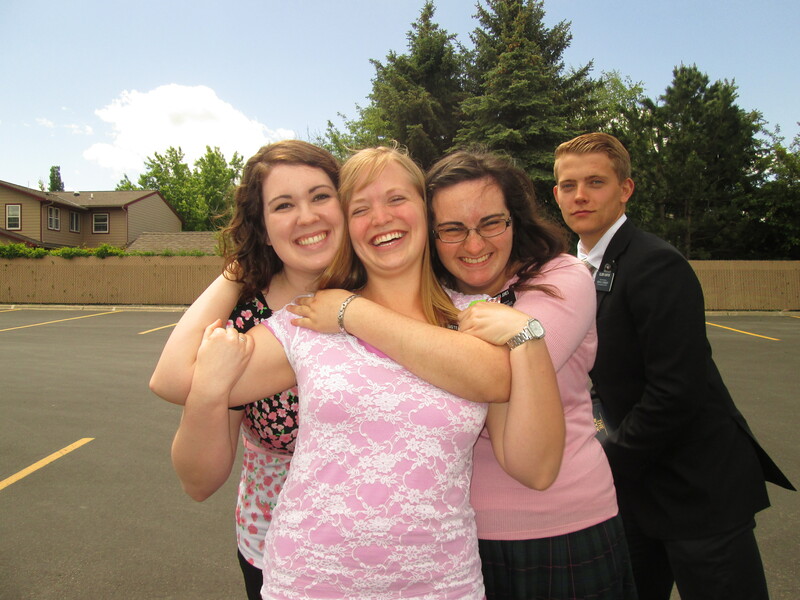 Jones) Photobombed by Elder Curtis. On Wednesday, we had one of the coolest miracles of my mission so far, no joke. First off, you need to know what the “Liahona experiment/principle” is. So Brad Wilcox wrote a book about it, but basically it’s where you pray in faith with a question in mind and then let your scriptures fall open, and you start reading in faith and you find your answer. First off a disclaimer, this is not to be used as a “seeking revelation in all things” type of thing- so don’t ask what you should eat for breakfast. But, I really gained a testimony of this for sure on Wednesday. So my companion lost her bike lock keys on Sunday. We had looked for them several times, but to no avail. Finally, Wednesday night, we decide to make a concerted effort to find them. Please note, we were starting to reach desperation and thought we might have to call the police to come cut the lock. I said a personal prayer and felt prompted to try the Liahona principle, and specifically to do it in the New Testament (which was unusual because typically the Book of Mormon is better). So I section out the New Testament in my quad and let it fall open. It falls open to Revelation 12, which also happens to be the only place in my New Testament where I have a piece of paper tucked in from seminary. Feeling kind of disappointed that it fell open there, I still decided to start reading in faith, so I start with Revelation 11 on the left. I get to Revelation 11:8, which says “And their dead bodies shall lie in the street…”. The Spirits hits me so hard and I yell to Sis. Jones, “We’re going outside to look in the street!!”. So we go outside and I’m looking along the street, and the spirit hits me again and tells me to go look by the bike rack. It takes me a second to obey because in my mind I’m like, “we’ve looked there before!”, but my faith is pretty strong at this point so I head over. No sooner can we see the bikes than I see her keys lying on the sidewalk! It was soooo awesome. I love the Holy Ghost so much! It meant so much to me to know that Heavenly Father was aware of two sister missionaries in Montana with a set of lost bike keys. Also, the scriptures are an amazing source of revelation!! Thursday morning started out kind early with us getting up at 6am to meet the other missionaries at the stake center at 6:15 for yoga! One of the sister missionaries is a yoga instructor so she led us in a couple exercises. It was SO. HARD. Haha, not gonna lie, I have a new respect for yoga. I did better than I thought I would, but I definitely felt it for the next couple days. This past weekend that had a huge four stake youth conference at our stake center, and we helped out quite a bit with serving food and such. The best part of helping out though was that 8 of us missionaries did a “panel” for one of their classes! It was a Q&A format, and it was cool because even though we did it four times for each rotation, each class was unique and different. Several of the youth said that it really inspired them to more seriously consider going on a mission. This weekend we had a surprise visit from a previous sister that I served with! She went about three months ago, and she’s at school in Rexburg which is only like a three hour drive from Bozeman. 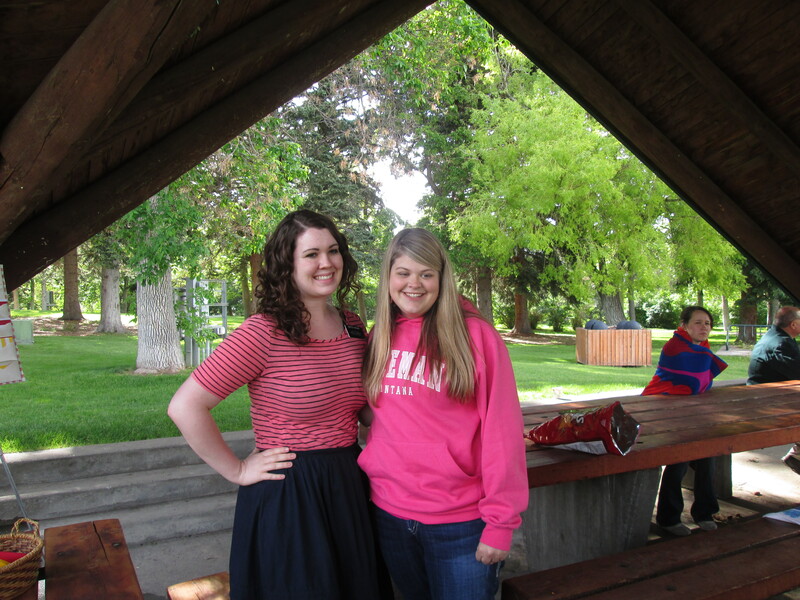 It was fun to get to see her, even though it was weird because she wasn’t a missionary any more! She had served in Bozeman for a while, so she went with us to several teaching appointments. Well, that’s all I can think of to write this week! Love you lots! ← A week of General Authorities!